This document shows how to measure the current transfer ratio over frequency. 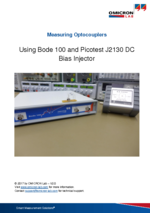 This application note shows how the CTR (current transfer ratio) of an optocoupler can be measured over frequency using the Bode 100 in conjunction with the Picotest J2130A DC Bias Injector. Many power supplies use optocouplers in the feedback loop. The stability and overall performance are often dependent on the CTR of the optocoupler. CTR curves over frequency are normally not provided by the manufacturer. The Bode 100 in conjunction with the Picotest J2130A DC Bias Injector supports measuring the CTR starting from 10 Hz up to 40 MHz.